Since November 17 the gilets jaunes movement has been spreading across France. Protesters from around the country are demanding fairer taxes, wealth redistribution, and more direct democracy, with demonstrations in multiple cities every Saturday. According to polls, the movement is supported by a majority of the population. So far, the government’s response to all this has essentially been repressive, More than 1,700 people have been injured, of which at least eighty-two are seriously hurt, and ten fatalities have been confirmed since the beginning of the movement. (A constantly updated list can be found here). The deaths mainly owed to road accidents, where angry drivers, blocked in their cars, drove over protesters. But one was caused by the use of police weapons: an eighty-year-old woman in Marseille was closing the shutters of her apartment when a tear-gas grenade hit her in the face. As of January 8, 5,339 people had been arrested, of which 1,234 were released with no further action. The following Saturday (January 12) eighty-thousand police officers were deployed against fifty-thousand protesters (official numbers). The protests have also been marked by numerous cases of deliberate violence against protesters. These abuses owe not only isolated “violent” policemen but are in fact part of an overall strategy for “maintaining order” in the face of the gilets jaunes. In turn, they show how the monarchical presidential office serves to empower the tools of repression. Despite calls from NGOs to rein in the use of force, the government has kept to a strategy of violence. On Saturday January 12, ten further people were seriously injured at demonstrations, even though the government had itself declared that the demonstrations were peaceful. The police’s excessive use of force especially threatens the most defenceless protesters, as documented by numerous videos. These show a disabled man being dragged out of his wheelchair and thrown on the ground by a policeman, or a woman (who was also not resisting) being hit on the back of her neck and dragged across the floor, apparently unconscious, over dozens of meters. In this video, one can see protesters coming to the aid of a seemingly unconscious person on the ground, after he was hit by a water cannon, themselves being targeted by the water cannon and grenades. Police were also recorded hitting an elderly man passively sitting at a bus stop while his daughter desperately screams and begs them “please stop.” Not only protesters but also journalists have been attacked, threatened, and insulted by the police. A police commander recently decorated with the Légion d’Honneur (the highest state award in France) was also seen assaulting protesters. On his Twitter page, journalist David Dufresnes is compiling evidence of suspected police abuses, which he is also reporting to the Interior Ministry. Cross-checking to avoid double counting or false reports, he has currently recorded more than three hundred cases, a number that increases drastically every Saturday (the number rose by over fifty between January 5 and 12). The Mediapart site has just set up a page to make his data easier to access. This is not just a catalogue of isolated incidents. This shocking situation partly comes from the French authorities’ strategy to maintain order, which relies on two mottos: a mandatory use of force and a proportional answer to threat. Many countries have long ago abandoned this strategy and developed newer approaches more similar to the German “Deskalation” (de-escalation) approach, which is based on crowd psychology, pacification of crowds, and Anti-Konflikt-Teams. When it comes to “the mandatory use of force,” one of the main problems is the use of allegedly “non-lethal” weapons such as LBD rubber-ball guns (similar to “flash-ball” guns). Most of the serious injuries were inflicted by LBD. These balls are only meant to be shot close to the ground, yet at least twelve people have already lost an eye, including a fifteen-year-old kid. 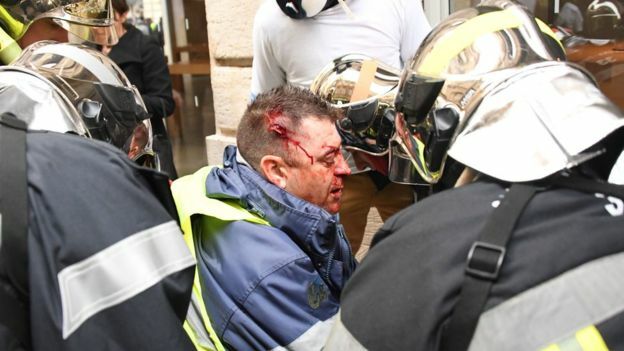 Olivier Béziade was hit in the head by a police flash-ball during a ‘yellow vest’ protest in Bordeaux, resulting in a brain haemorrhage. Already ten teenagers (between fifteen and eighteen years of age) have either lost an eye, or had their jaw or even forehead fractured. Photographers and journalists also claim to have been directly targeted by police forces. On January 12, a photographer had his knee broken, leaving him off work for over six weeks. “I was clearly identifiable in the middle of the protesters scattered by the tear gas. They aimed at me, and it hit my knee,” he reports. That same day, three people were hit in the face by police ammunition: a fifteen-year-old boy shopping in Strasbourg was wounded, a twenty-eight-year-old man was put in an artificial coma, and another protester (a fireman) was shot from behind, and is now showing signs of paralysis after a coma. Tear gas grenades (eight thousand of them were used on December 1 alone) and sting-ball (“désencerclement”) grenades are also used, both extensively and abusively. A tear gas grenade was found in the hood of a little girl’s coat. The heat of the grenade burned through the garment, though luckily the girl was not injured. Her family was just passing by and was not demonstrating. While tear gas grenades are not supposed to be shot directly at protesters, several videos show them being fired at clearly peaceful, and sometimes even seated protesters. When triggered, these sting-ball grenades emit rubber balls into a radius surrounding the device. These offensive grenades are supposed to be used only when police are surrounded by protesters, to open up a way out, in the interests of self-defense. Yet eight hundred of these grenades were thrown into the crowds on December 1 alone. 339 of the sting-ball grenades used that day were the controversial GLI-F4 model. These latter are recognised as dangerous, even by police unions, as one of their older models killed protester Rémi Fraisse during demonstrations in 2014. The stocks of GLI-F4 grenades were supposed to be emptied, and never used again. Yet in the context of mass demonstrations it seems the government has not kept its word. France is the only country in the world to use such grenades against protesters. They have resulted numerous terrible injuries and at least four lost hands (including the right hand of a twenty-one-year-old who came to demonstrate with his family), leading some to press charges against the state. One man also lost his ability to hear due to the deafening noise they create. The extreme tension is also visible in the use of dozens of armoured vehicles in the streets of Paris, and in the spectacle of policemen with assault rifles at the demonstrations. The government is now sending special services such as the BAC (Brigade anti-criminelle) and armed police (gendarmerie) against protesters. These forces are not specialists in maintaining order; rather, they are usually sent to arrest and fight against dangerous criminals and terrorists. This has itself contributed to the escalation of violence. These shocking images aside, everything is also being done to prevent people from demonstrating at all. Masks and glasses for tear gas protection have been taken away from protesters (to prevent them “hiding their faces”) and police also seem to be confiscating physiological saline (which is illegal). 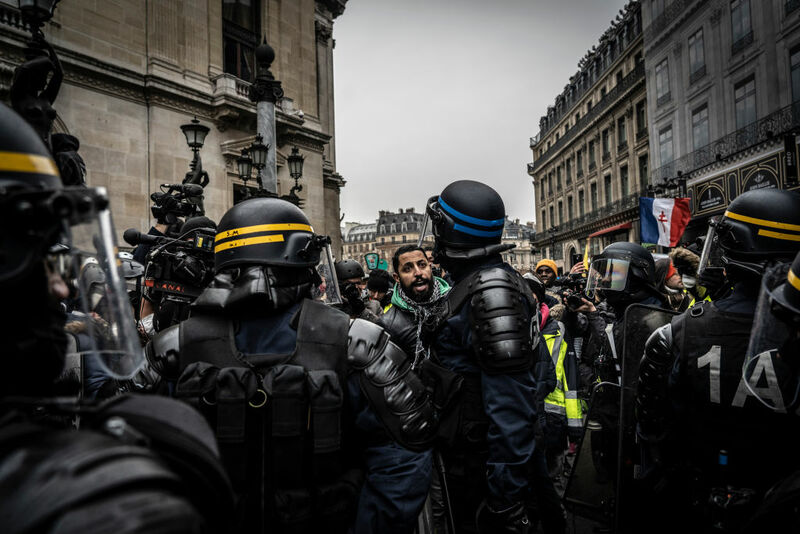 Amnesty International recently released a statement to insist on the fundamental right to demonstrate in France, and expressed particular concern over these illegal seizures. Some have also reported that police prevented interventions by street medics (volunteers who do first aid on demonstrations), by removing their first aid equipment, and sometimes even shooting at them. Protestors are regularly apprehended on simple suspicion. Left-wing activist Julien Coupat was arrested for thirty hours for the fact that in his car he had a yellow vest (which is mandatory by law), paint bombs, and a helmet. Some were arrested for having a hammer in their cars; vehicles are often searched without warrant. 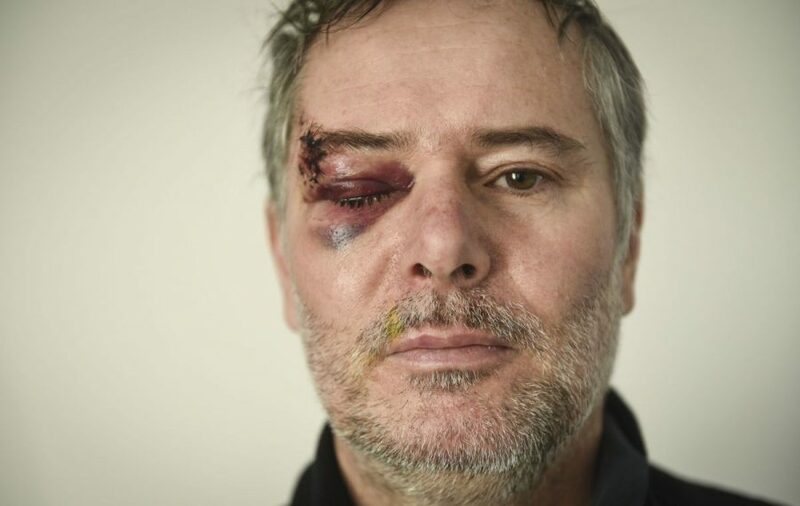 Freelance photographer Jean-Claude Moschetti was left with seven stitches in his eye and permanent damage to his sight by a police tear gas cannister fired in Rennes. People were arrested on the charge of being part of “a group aiming at committing violence and causing damage.” As being more than one person can be considered as being “in a group,” it is very easy for the police to arrest anyone who just seems to be going to a demonstration, on the basis of suspicion alone. Demonstrations which were not “declared” in advance were also repressed by police (though international law requires no such declaration, precisely in order to prevent people being discouraged from exercising this basic right). Recently, the prime minister asked for restriction of the right to demonstrate, as well as the possibility of keeping files on protesters who might be violent, to forbid them to demonstrate, as was done already in the case of soccer hooligans (with many abuses). Something of a problem, here, is that the right to demonstrate is a basic human right, guaranteed by the Declaration of Human Rights, while accessing a stadium is not. Such attacks against freedom to demonstrate were already made during the state of emergency implemented after France had been targeted by terrorist attacks. Environmental protesters were prevented from demonstrating during the Paris COP 21, and forced to stay at home, under the powers granted by the state of emergency. The question also remains open as to who will decide on who goes on the list of banned protesters. In the case of soccer hooligans, it was not the legal system itself but a special administration (with no similar independence) that decided: and this could clearly lead to abuses. Criticised even within Macron’s own parliamentary group, the government is unfortunately proceeding full steam ahead with these measures. During the demonstrations, hospital staff were also asked to take down the names of gilets jaunes seeking treatment, officially in order to track the number of victims. This directive, which was supposed to be temporary, is usually only activated in the context of terrorist attacks, as it can clearly endanger the freedom to demonstrate. All of these extreme measures are now possible because of the president’s recent transfer of the state of emergency into normal law. More recently, and as a sign of the limits the government is pushing, a bid to raise funds to pay the legal fees of a demonstrator accused of violence against policemen was closed down by the Leetchi crowdfunding site, after a minister asked it to do so on TV, moreover asking for donors’ names and data. Yet the crowdfund is legal, and it was therefore illegal to close it down, and indeed to give the names of the donors (which Leetchi refused to do). Further scandal came with a video posted on social networks in December. A policeman recorded the arrest of at least 122 youth (the youngest was twelve and most were around fifteen-sixteen), in Mantes-la-Jolie, a suburb of Paris. They were forced to stay on their knees, hands behind their heads, in an ordeal that apparently lasted some four hours. In the video, the policeman shouts: “Ah! finally a quiet classroom, if only your teacher could see this!” Though some of those kids were suspected of burning a car and throwing projectiles at police, most were just running away from tear gas (and some were just passing by in the street). Only twenty of were real suspects. The interviews of suspects, in some cases unrecorded, were conducted without the presence of a lawyer, and the kids spent the whole night in the police station — sometimes fifteen to a cell, in cells designed to contain five people. Arrests of suspects have also got out of hand: recently, the special forces in charge of fighting terrorism (RAID) made an intervention at 6 AM, smashing through the door of a gilets jaune’s apartment and handcuffing him while he was still in his bed with his partner. All this danger for the right to demonstrate has to be put in the context of the French Constitution as well as the political situation resulting from the 2017 presidential election. In France’s Fifth Republic, the president has sweeping powers such as the right to legislate without a vote in Parliament (such as with the “decrees” already used by Macron for his Labour Law). While Macron only took 24 percent of the votes (among those who did vote) at the first round of the presidential election, his party holds 54 percent of seats in the National Assembly. Macron’s planned reform of the Constitution would concentrate even more power into the president’s hands, heralding a grim future for political pluralism in France. His reform promises to reduce the number of members of parliament by 30 percent, even though France already has among the lowest number of MPs in Europe relative to population. It will moreover limit the opposition’s right to propose amendments, and introduces only meagre attempts to increase proportionality. This reform is related to the preparation of a new law against “fake news,” criticised by the entire opposition. Its vague definition of what “fake news” actually is highlights the threat it poses to free expression. Far-right leader Marine Le Pen’s popularity is still not decreasing in the polls, and she could even reach historic highs at the coming European elections. Yet beyond that specific threat, the perspective of a president-king Macron with weakened opposition is itself a frightening one. Doubts over the government’s transparency are fuelled by recent scandals like the beating of protesters by then-Macron bodyguard Alexandre Benalla (recently found to be still in possession of diplomatic passports for his business in Chad), the Crase case (a friend of Benalla’s, seemingly paid by Russian oligarchs), and suspicions over Macron’s electoral campaign accounts and fundraisers. Juan Branco, a former legal advisor to Wikileaks, also reveals in his forthcoming book Crépuscule the shadow network which drove forward Macron’s presidential candidacy in 2017, made up of several billionaires owning France’s biggest media (Le Monde and Paris Match, for example). The gilets jaunes have taken an opposite approach, calling for democracy, less corruption, and less concentration of power by the central government. Some even call for the possibility of organising citizen referendums, like in Switzerland. Several demonstrations have now been specifically dedicated to protesting against this political repression, notably the whole recent “Act X” of the movement, as well as commemorations for the injured and dead. And even at one of these remembrance events, one prominent figure in the movement was arrested for illegal demonstration. Yet as the fate of both the gilets jaunes and the government remains uncertain, it seems that violence is set to intensify.